You want the best for your elderly loved one. So, when a parent lives with a chronic illness, you step in as the caregiver. Conditions like cancer, heart disease dementia require constant care. You want to be there for your mom or dad. But don’t put yourself at risk for emotional and financial burnout. Being the sole caregiver can compromise you and your loved one’s health. Per the National Center on Caregiving: "...most caregivers are ill-prepared for their role and provide care with little or no support, yet more than one-third of caregivers continue to provide intense care to others while suffering from poor health themselves.” Without reliable support, the caregiver may suffer physical pains, depression and ultimately burnout. You don’t have to do it alone. Free yourself from the guilt. Getting professional support for Mom or Dad is okay. The outside help will allow you and your loved one to sustain a healthy relationship for the long run. Professional caregivers are empathetic, compassionate people. You can find outside support, which focuses on creating a caring bond with your loved one. Then, you will have the peace of mind knowing the needs of your senior parent are being met and they’re getting compassionate care to alleviate pain, distress, loneliness and anxiety. While palliative is medical in nature, a palliative caregiver will tend to your loved one’s physical, social, emotional and spiritual needs during a critical time. Palliative home care focuses on maintaining a comfortable quality of life for your loved one while they recover from injury or illness. Examples of palliative home care range from helping to manage chronic pain to having regular conversations to foster social connection. The care can start at any time, and there is no "end date." A palliative caregiver is an outstanding supplement to medical palliative care. Palliative care is NOT a sign of “giving up.” Instead, the opposite is true. Palliative care focuses on your loved one's recovery or quality of life and a palliative caregiver supplements that effort with compassion and comfort. The earlier you begin palliative care, the better the long-term results. According to a 2010 study featured in the New England Journal of Medicine, lung-cancer patients who received palliative care early in the course of their cancer treatments reported less depressive symptoms, higher quality of life, and also lived almost three months longer than a similar group of patients who did not receive palliative care. 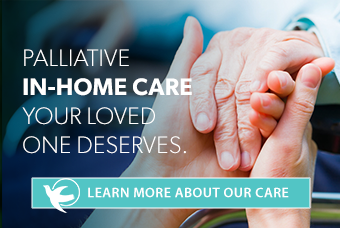 But a professional home care provider can maximize your parent’s comfort, especially if your professional caregiver is certified in palliative care. The feedback will help you when making important decisions down the road. You will feel more confident knowing your choices for your loved one are based on observations by yourself and a professional. At the same time, you will get the reprieve needed to continue this journey with your senior parent and be the support that your parent needs. For more information on transitioning to palliative care and how a certified palliative caregiver can help, click here.